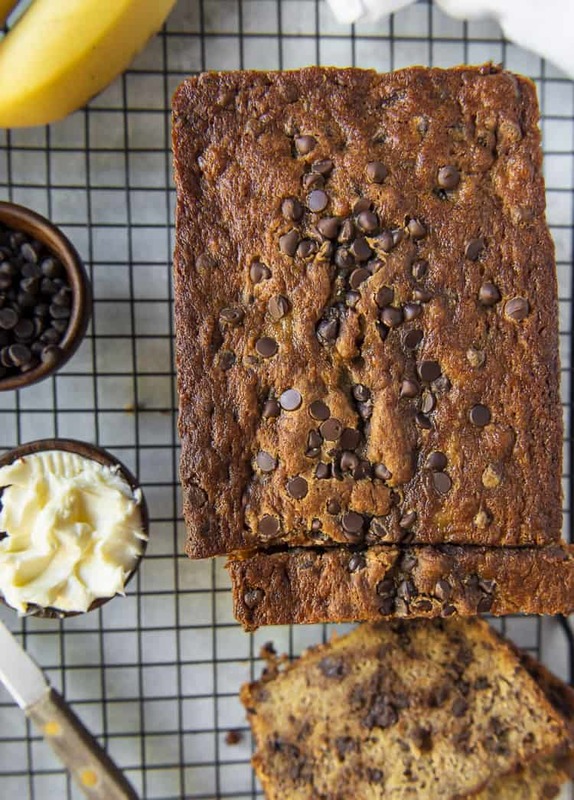 This one bowl Chocolate Chip Banana Bread is the best ever! 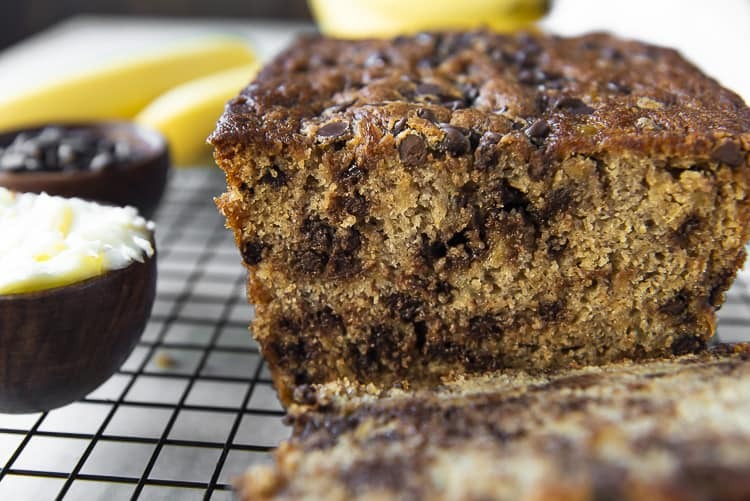 Supremely moist thanks to plenty of very ripe and chunky bananas, this banana bread has irresistible gooey chocolate in every bite! Cold weather never fails to get me baking. If you’ve been around a while, you might know how I whine and complain about living in Florida. About how hot it is, and how we don’t get snow and whatnot. But wow. I feel for everyone that’s stuck in that Polar Vortex right now. 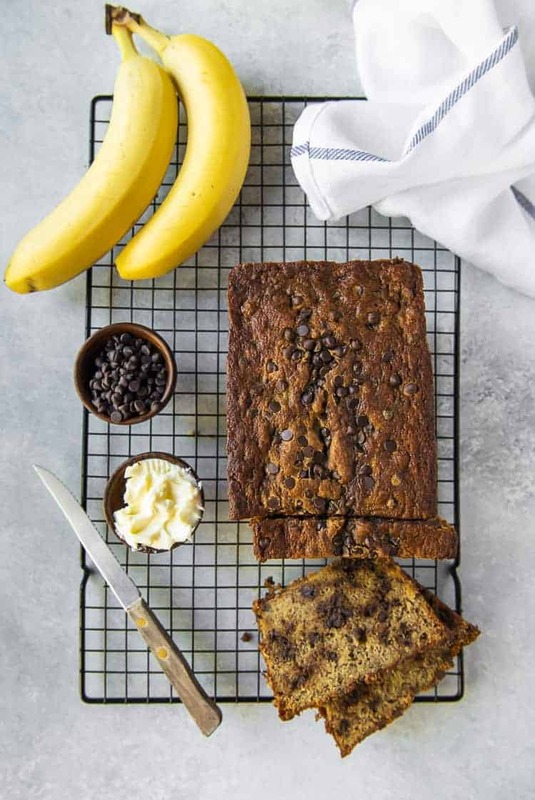 I imagine if a cold week in Florida gets me excited to bake all the things – you folks need this Chocolate Chip Banana Bread even more than I do. JUST TAKE ME TO THE CHOCOLATE CHIP BANANA BREAD ALREADY! 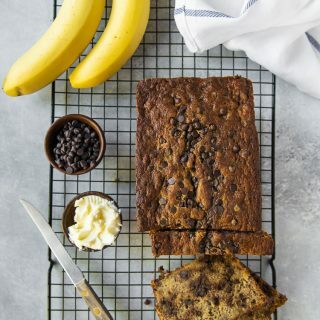 If you’d rather skip my (pretty darn helpful) tips and tricks, essential cooking info, and similar recipe ideas – and get straight to this deliciously easy banana bread recipe, just scroll right on down to the bottom of the page where you can find the printable recipe card! If there’s one treat Abe is eternally obsessed with and ready to devour, it is banana bread. Of every loaf I’ve ever made, he has destroyed 3/4 of all of them. So, I mean, at least I get a couple slices – but I do usually have to sneak mine before he realizes that it’s in the house. My favorite banana bread of all time is a blueberry coconut version, but this one is an extremely close second. 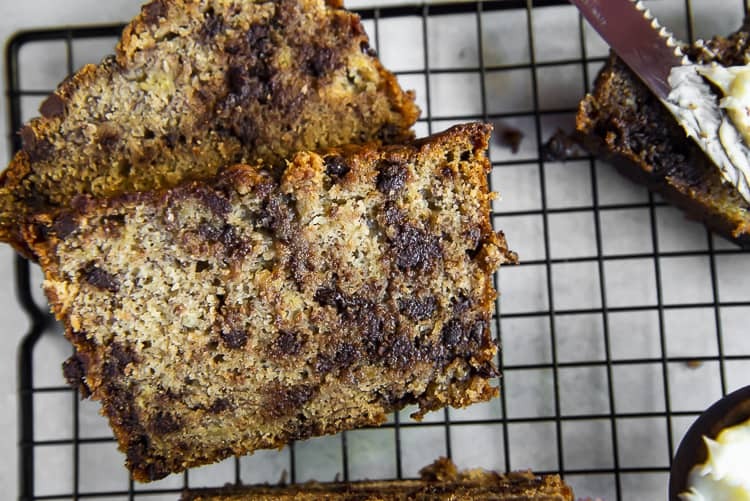 It’s incredibly moist and banana-flavored, thanks to using 4 (blackened) ripe bananas. This also makes it dense and pretty close-textured, which is my preferred kind of banana bread. And of course, there’s the chocolate. It’s everywhere. It makes everything better, even negative temp blues and frozen pipes. It can be so disappointing to see your gorgeous banana bread look not so pretty on the inside if your chocolate chips fall the the bottom of the bread pan. Luckily, this is easy to avoid! I love to use mini chocolate chips in this recipe – they’re light and have an easier time staying suspended in the batter. If you’ve got larger chips or even chunks of chocolate, just toss them with a couple tablespoons of flour prior to folding them into the batter. This is a great tip to apply to all kinds of add-ins in the future, from nuts to fruit. As I mentioned, using very ripe bananas will give you the best flavor and texture. As bananas ripen and the fruit breaks down in the skin, the sugar content rises. For most people, they’re not suitable to eat that way, but that cloying banana flavor makes for perfect bread. After baking the banana bread, allow it to cool in the pan for 15-20 minutes, then move it to a cooling rack for a while longer. The key to maintaining the moisture is to wrap it in plastic wrap while it’s still warm. The plastic traps the moisture inside and keeps it from drying out. We keep our banana bread on the counter, but a lot of people prefer to refrigerate it. Now, banana bread never lasts more than a couple days in our house, which is the max it will safely keep there with this method. 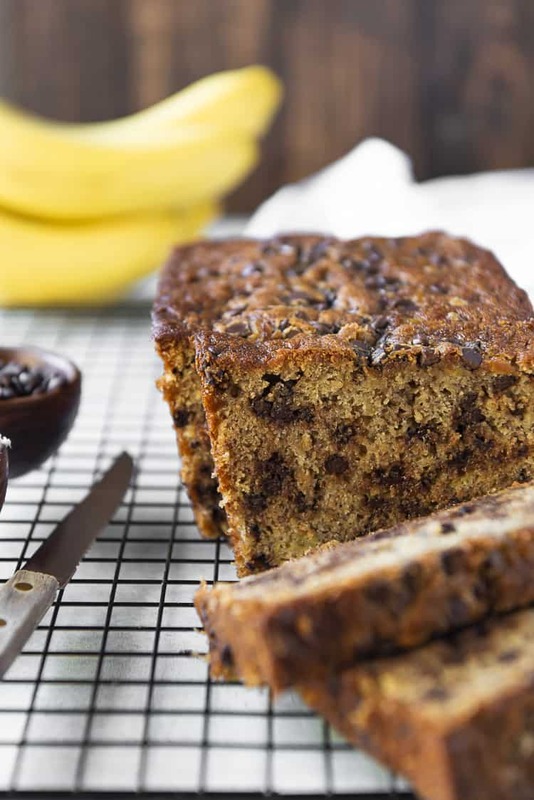 If you want to store your banana bread longer, pop it – wrapped – in the fridge after it cools. It will last about 1 week in there, so you can nibble to your heart’s delight. And if that’s what you end up doing, please…tell me how. One slice is never enough for us. First, preheat oven to 350 degrees F. Grease a 9×5 loaf pan and set aside. Next, in a large bowl, use a hand mixer to cream together butter and sugars for 2-3 minutes, until well combined and fluffy. Then, add in the eggs and vanilla and mix well. Add ripe bananas, mashing the bananas into the bowl, leaving some larger chunks behind. Mix well, but really try to keep some of those banana chunks whole. Next, sift the flour, baking powder, baking soda, and salt over the wet ingredients. Use a spoon or spatula to mix everything until it’s just combined, but do not over mix. Fold in the chocolate chips. Finally, pour the batter into the prepared loaf pan. Bake the banana bread for 55-65 minutes, or until the loaf is set and a knife inserted in the center of the loaf comes out clean. Allow the bread to cool for at least 20 minutes before serving. If not serving immediately, wrap the still warm bread in plastic wrap, ensuring that it stays moister longer. 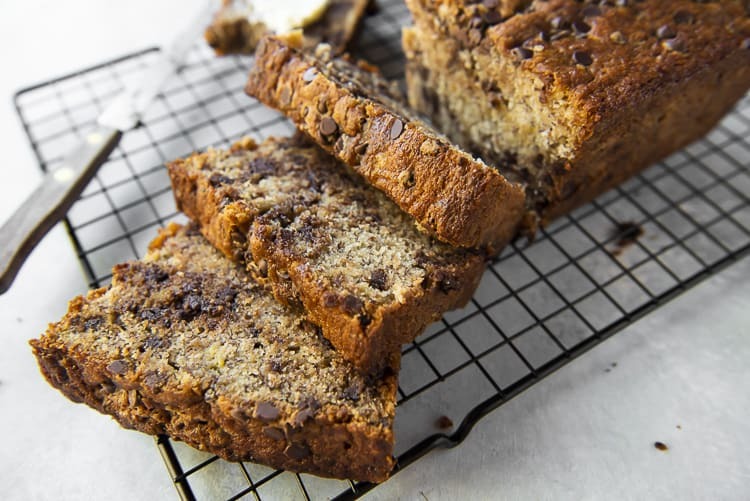 LOOKING FOR MORE RECIPES USING RIPE BANANAS? Preheat oven to 350 degrees F. Grease a 9x5 metal loaf pan and set aside. In a large bowl, use a hand mixer to cream together butter and sugars for 2-3 minutes, until well combined and fluffy. Add in the eggs and vanilla and mix well. Add ripe bananas, mashing the bananas into the bowl, leaving some larger chunks. Mix well, but try to keep some of those banana chunks whole. Sift the flour, baking powder, baking soda, and salt over the wet ingredients. Use a spoon or spatula to mix everything until it’s just combined - do not over mix. Fold in the chocolate chips. Pour the batter into the prepared loaf pan. Bake for 55-65 minutes, or until the bread is set and a knife inserted in the center of the loaf comes out clean. 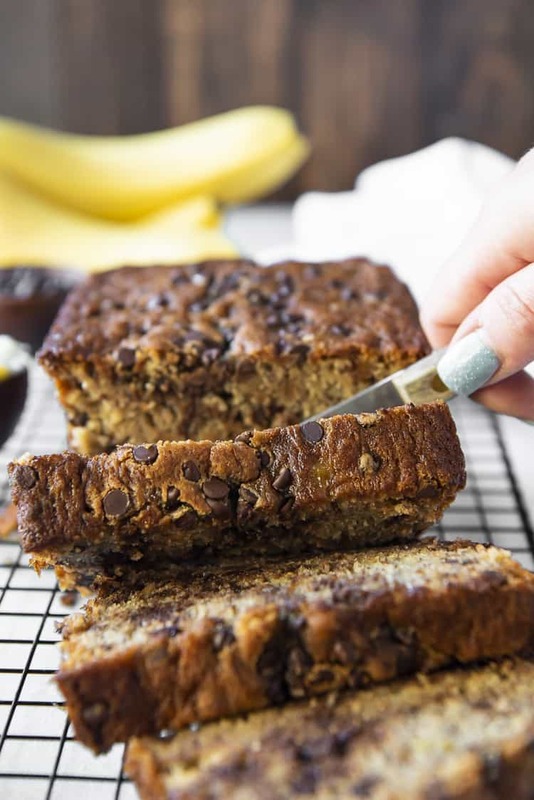 PIN THIS CHOCOLATE CHIP BANANA BREAD FOR LATER!